Dr. Wright is a Colorado native, having been born and raised in Grand Junction. He attended Grand Junction High School, graduating in 1982 and obtained his Bachelor of Arts degree in Biology from Colorado College in 1986. 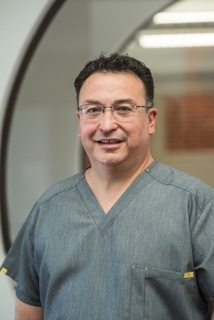 Dr. Wright then attended the University of Colorado School of Dentistry, graduating in 1990. Immediately after his dental school graduation, Dr. Wright served seven years of active duty with the United States Air Force as a general dentist. He obtained further dental and military experience while being stationed at Edwards AFB, Bitburg, AB; Spangdahlem, AB; and the United States Air Force Academy. Upon leaving the Air Force Dental Corps in 1997, Dr. Wright opened his solo practice by purchasing a unique office that had been in existence since the 1950’s, which was once a corner grocery store. This uncommon dental practice is situated in the heart of a residential area, less than one mile away from where Dr. Wright attended college. With over two decades of experience in the dental profession, Dr. Wright has taken thousands of hours of continuing education. He continues to immerse himself in mastering the latest techniques and has a passion for new technology. 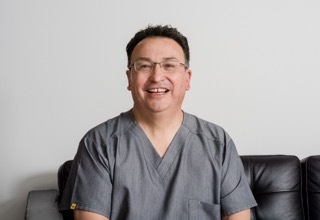 He takes great pride in being able to offer his patients the latest advancements in implantology, Botox®, laser dentistry, Six Month Smiles, and digital scanning/ CAD-CAM. Dr. Wright is married and has two children, Julia and Mason and is blessed with three grandchildren. His outside interests include travel, music and concerts, and great food and libations. He is also a dedicated supporter of all things pertaining to Colorado College.